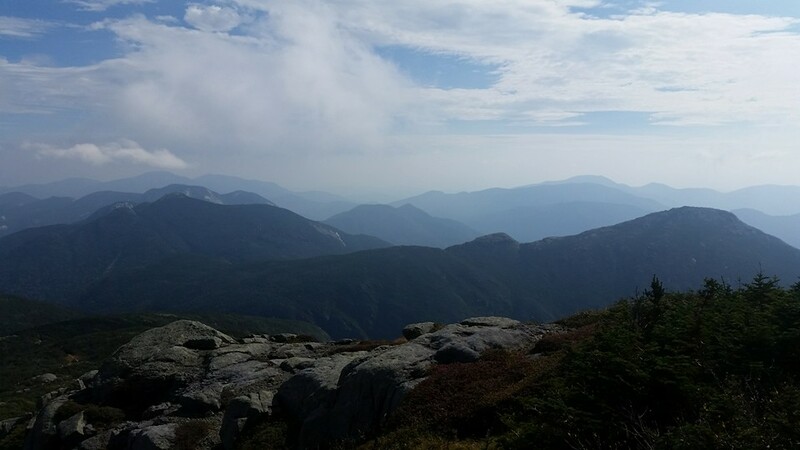 Mount Marcy is the Iconic Adirondack High Peak Mountain. 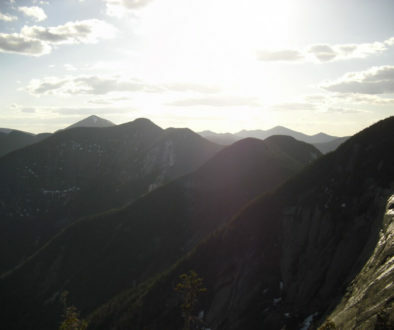 Standing at 5,344ft, Marcy is the tallest mountain in New York State. 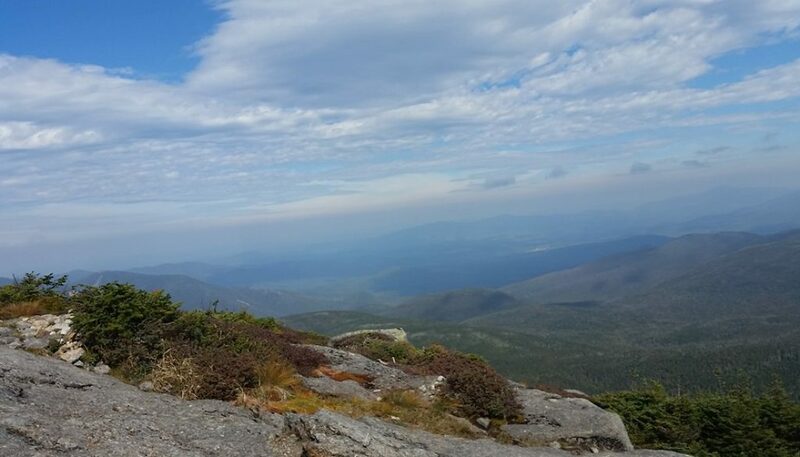 Its 360 degree view from its rocky bald peak draws first-time and experienced hikers from near and far. 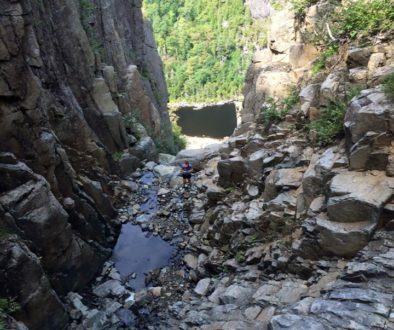 Not only is Marcy’s 14.7 mile hike from the ADK Loj an enjoyable one, it’s perfect for a good paced trail run. This past weekend I headed out to do just that. 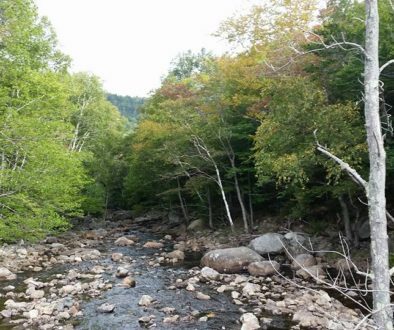 The trail up Marcy is a gradual accent, with minimal elevation losses. The trail is only moderately technical, which allows a pretty good pace with some fancy foot work. 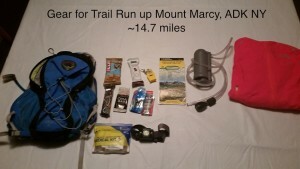 Friday night I geared up for my trail run up Marcy on Saturday, packing only what I thought I would need. Below I show the gear I carried packed into my 6L Osprey trail bag (shown on the left). I brought a water filter, Camelbak, map, rain jacket, food, a first aid kit, and a head lamp. The first aid kit and the headlamp were only precautionary items, and thankfully I didn’t need either. My run started out a little rough, with tight legs from the 2 hour car ride up North. 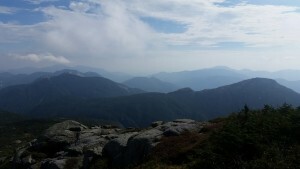 However I managed to keep a good pace up the trail and make it to the summit before it got to crowded. The summit was a bit windy, and I couldn’t stay up there for long so I headed back down after a quick snack behind a boulder to stay out of the wind. Since it was so windy, I didn’t remember to snag a picture until I was back down to Little Marcy. The view, however, was still just as gorgeous.